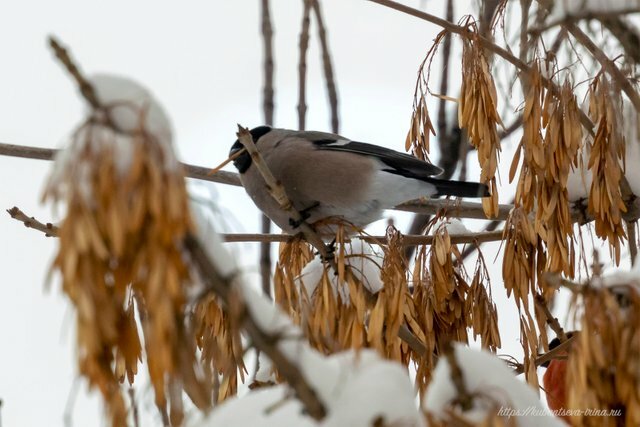 In recent years, I rarely see bullfinches in our city. 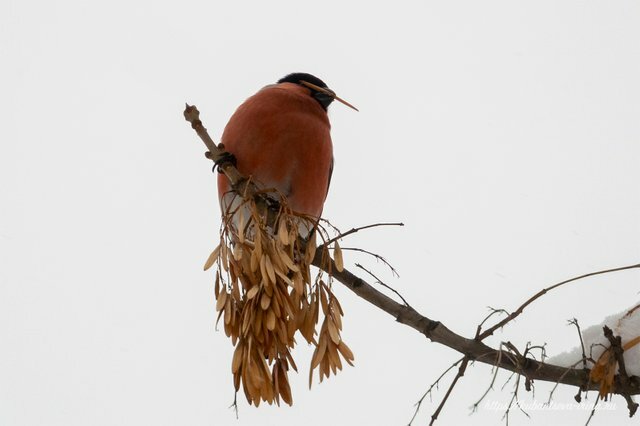 But this winter I was lucky to meet these birds several times. I took these photos yesterday. The snow did not have time to melt, but the new one fell again. 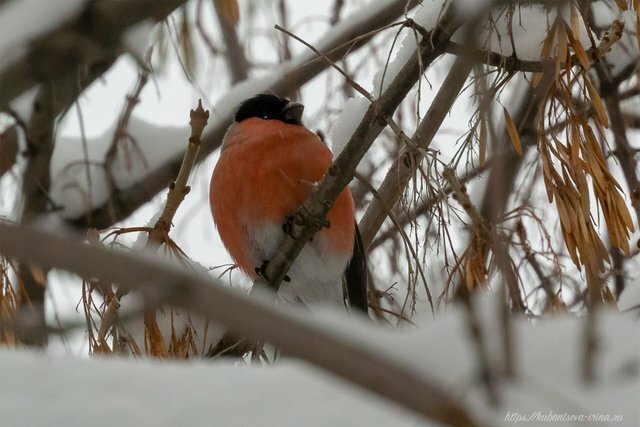 Red bullfinches were perfectly visible on the background of white branches and a pale gray sky. These beautiful birds are located on the ash. Bullfinch male looks very elegant with red breast. The bullfinch female is gray and looks more modest. Текст на русском языке можно почитать в моём русскоязычном блоге. Thank you, @keithboone, for stopping by my birds! 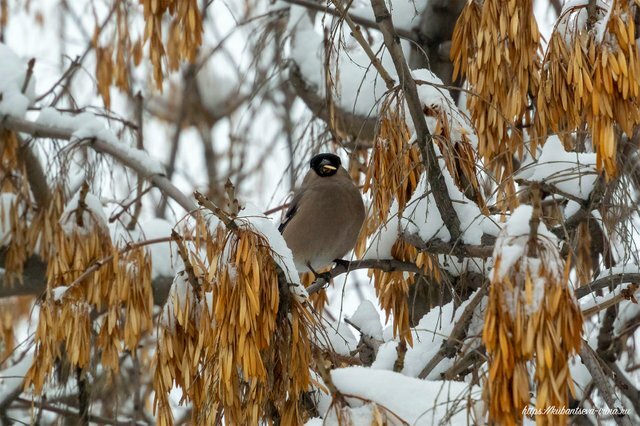 Thank you for giving me a wonderful reason to post and show photos of bullfinches. Congratulations! This post has been upvoted from the communal account, @minnowsupport, by Soroka/sorokkaa from the Minnow Support Project. It's a witness project run by aggroed, ausbitbank, teamsteem, someguy123, neoxian, followbtcnews, and netuoso. The goal is to help Steemit grow by supporting Minnows. Please find us at the Peace, Abundance, and Liberty Network (PALnet) Discord Channel. It's a completely public and open space to all members of the Steemit community who voluntarily choose to be there. They are such pretty birds! We don't have them here and I would love to see one! Thank you, @melinda010100, for visiting my blog! In recent years, I often hear that bullfinch stopped flying. And I have not seen them for a long time. But ten years ago and earlier these birds flew often in large flocks. Perhaps they find food in the forest, and perhaps they fly away from the big, noisy, dirty cities in which we now live. That worries me. I live in the forest and I feel like the bird populations are way down. I no longer see large numbers of birds like I did before. Howdy soroka74! what a great set of shots you got for us! That first one contrasting against the white background is stunning and the rest are all good too! Thanks for stopping by my blog to look at the birds! Howdy there soroka74! you are very welcome, you have some great pictures and posts!